I'm unavailable for dates in red! Below you will see my availability calendar for wedding photography and photo sessions. I'm unavailable, or already booked for dates in red. This calendar might not be updated, so please, always double check with me before planning around my availability. I'm already 50% booked for 2020. I limit the number of wedding events to 32 to ensure fast turnaround and enough free time for other personal and business projects. Because of that, I'm no longer booking sessions or events prior to August 2019. Nonetheless, I'll be happy to refer my favorite photography professionals should you request it. For optimal lighting and comfort (it gets HOT in the Caribbean), I always recommend starting right at sunrise or finishing right at sunset. Both options offer beautiful, golden, soft, diffused lighting that's the most appropriate for natural light portraits in the tropics. Sunrise times range around 6-7am depending on the season, and sunset times around 6-7pm as well. I'm available for overseas and destination weddings and photo shoots all over the United States and the Caribbean, but availability could be different for this kind of services because of travel times, so please contact me for more info on my availability & services for destination projects. From the first email I received from Camille, I knew I was going to love her. Warm, professional and efficient--everything you would want in your wedding photographer. Camille was truly a favorite of all our wedding vendors---so so fast on email responses, very friendly and personable and also very clear in her emails and website on what to expect. For me, I don't think you COULD find a better wedding photographer so save yourself the hassle of reading a million other reviews on wedding wire and belaboring an easy decision--Camille is the best choice for anyone getting married in the San Juan area--even better if you're getting married at La Hacienda Siesta Alegre as I think her shots of the magical twinkling lights and the beautiful atmosphere are unparalleled! 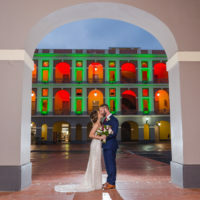 We got a package that included a one-hour session on top of the wedding day and I would highly recommend getting this package to get some shots in Old San Juan AND so you can get to know Camille before the day of. The wedding day go SO fast and you are fitting in so much that I think it's much better to get a chance to meet your photographer in person prior (I'm from Boston so only opportunity to meet was the week of the wedding). ALSO, you will not get faster turnaround on photos. I have friends who waited 4 months for their wedding proofs and I got mine in less than two weeks. We had a destination wedding in Puerto Rico and except for our venue, Camille was the first vendor we booked. I am SO happy we did. If you're getting married in Puerto Rico, book her as soon as you can. Not only is she professional, responsive, and surprisingly affordable, she's also just so good at what she does. We had perfect weather all week in Rincon, but had a downpour on the afternoon of our wedding. This is, of course, a little stressful. However, Camille made us feel comfortable and the pictures turned out beautifully regardless of the rain. She has such a great eye and her photos really look like art. Camille does a stunning job capturing not only the posed moments, but also all of the little memories and emotions throughout the day. Thank you, Camille!!! Wow! Where to start? When me and my husband decided to elope in San Francisco, we knew we eventually wanted to celebrate our love with friends & family back home. We set the date, and I immediately contacted Camille since I had been following her work for some years. She responded quickly and was very excited to confirm her availability on our date. After some months, Hurricane Maria struck Puerto Rico, we were very anxious and overwhelmed with this happening. We had lost communication with family, friends and also, vendors for our soon to be wedding, but not with Camille. Throughout this process, Camille was very encouraging and my go-to person for information on final wedding details. She went above and beyond. Safe to say, everything went amazing. The day of the wedding I was so relieved to see her as the friend who was there when I had lost hope. On our special day, before the First Look shoot, she walked to me, smiled and in a friendly hug said: “IT’S HERE”, referring to the happiest day of my life. She was phenomenal throughout the activity and always had a smile on her face. It makes a difference on your wedding day when somebody loves their profession as much as Camille does. When we saw the preview (which was ready surprisingly fast), I cried tears of joy seeing all the details that Camille captured. Whether you are getting engaged, eloping or getting married, you will not regret having Camille shooting that day. Thank you Camille, hope to see you for our anniversary!! !